These knobs have all sorts of uses for DIYers in general and boatbuilders in particular. The thread is either 1/4-20 or 3/8-16, and they both have stainless steel inserts. The smaller size fit our glue-on studs add they will work with 1/4-20 or 3/8-16 allthread. 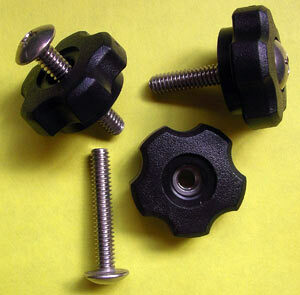 One thing you can use these knobs for is to mount our kayak footbraces or rudder control footbraces. 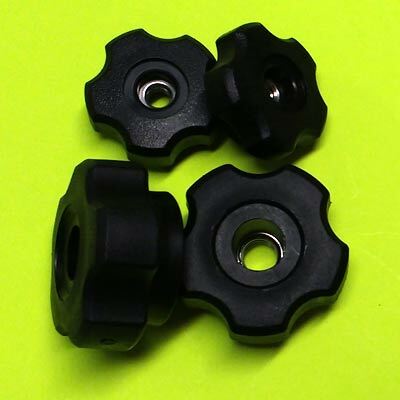 If you need a thumbscrew, it is easy to use a threaded (1/4-20) machine screw or piece of all thread rod cut to length and glued into the threads in the nut. Note: click the thread sizes in the chart above for a complete spec PDF file.